Here are pictures made yesterday of the work that Jack Allen has completed on the model of Micajah Clark Dyer's flying machine. 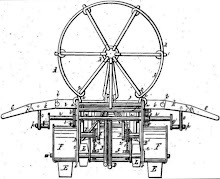 Jack's model is based on descriptions in Clark's application for the 1874 patent. The pictures were taken from several angles to show how the moving parts fit together to control the direction of the airplane. 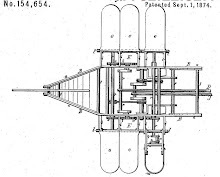 It seems that the primary purpose of this invention was to prove that it is possible to control the direction of an aircraft by controlling the direction of air flow across the craft. While gliders and hot air balloons were in use at that time, a method had not been invented for controlling the direction of their flight. Pilots were at the mercy of the wind for their direction, sometimes resulting in death. You can see the hinged wings and three sets of paddles that Clark used for steering the airplane. 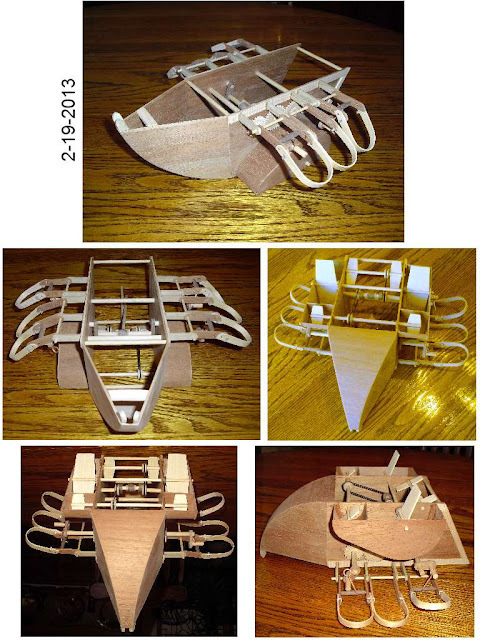 The rudder was not attached yesterday when these pictures were made, but it was also used for steering. Clark lived 17 more years after he invented this navigation method, but we have not found documentation for the improvements he made during those years. However, we know from testimony of eyewitnesses that he built an airplane that he flew over his fields some years before his death in 1891, securing his place as Georgia's first aviator. The model is nearing completion and we will continue to post updates to keep you informed.